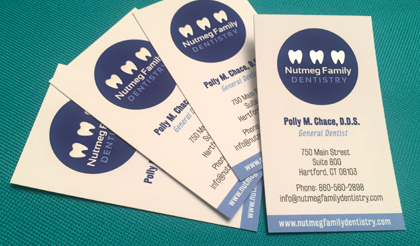 Kelly Design developed a new logo and printed these business cards for this Downtown Hartford Dental office. The business cards feature a unique printing process that uses a raised spot UV coating to give the three teeth a raised tactile feel. To further enhance the dimensional quality of the cards – they are printed on a heavy 16 pt. suede finish stock. Next in line for this client will be signage for their new location and a redesigned website.